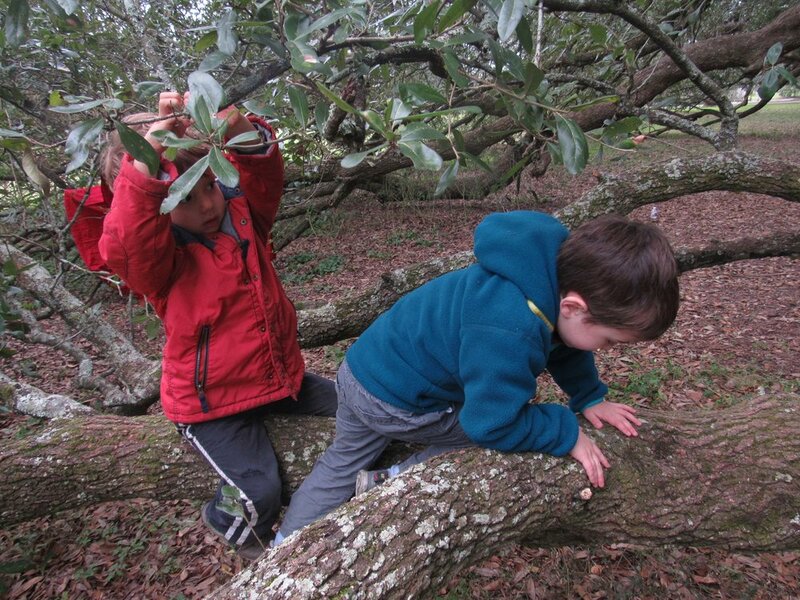 In Science Saturdays we set up camp under the long sprawling branches of one of the great live oak trees. We started our day exploring our tree. We returned to dips in the branches that were a favorite starting point last week and retraced our steps on the same branches. Then we began to explore new branches and finding new purchase for our feet. We worked on our communication skills, telling our friends when we needed to climb down and letting a teacher know when someone felt stuck. The group came together for a snack of oranges, apples, and bread. We then broke up into three different groups and focused on a different activity in each group. Mr. Ron’s group worked on making peeps (little wooden fairy figures) and then building houses for them. 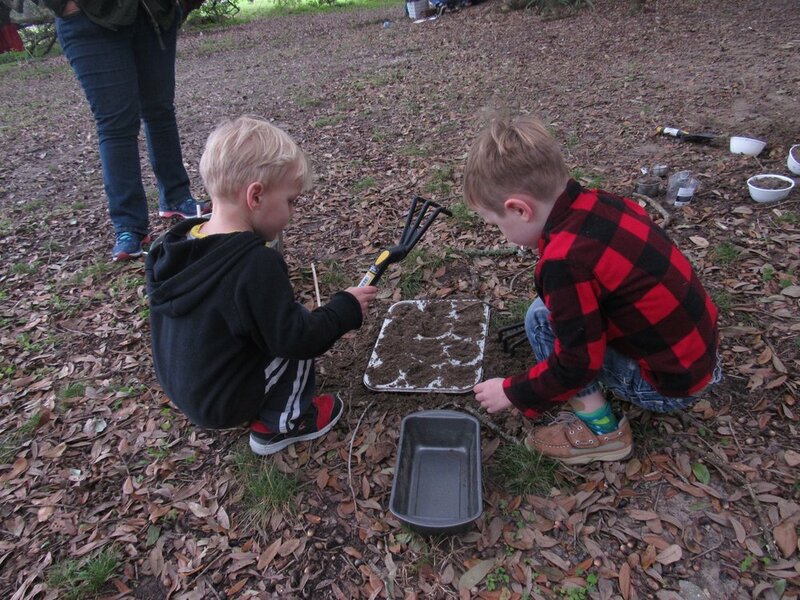 We see in this activity the children’s ability to use their imagination to create a structure and then find in the natural world elements that will bring this structure to life. This is an introduction to the scientific method by offering children a chance to test their hypothesis while building the structure. BEAU and LARRY are busy using shovels to move dirt from one place to another. LARRY “Don’t be too loud because the peep is sleeping,” Larry informs Mr. Ron in a whisper after gently placing his peep into a newly-constructed home. LEO and LUKE are coloring their peeps using markers and crayons. The pair are sitting under the live oak near the fairy houses constructed by a small group of their friends less than half-an-hour ago. “Mine lives in...this one,” Leo says, walking over to one of the fairy houses. “Mine lives in a new one,” Luke says, still focused on coloring his peep with a marker. “Actually, mine does too,” Leo replies. 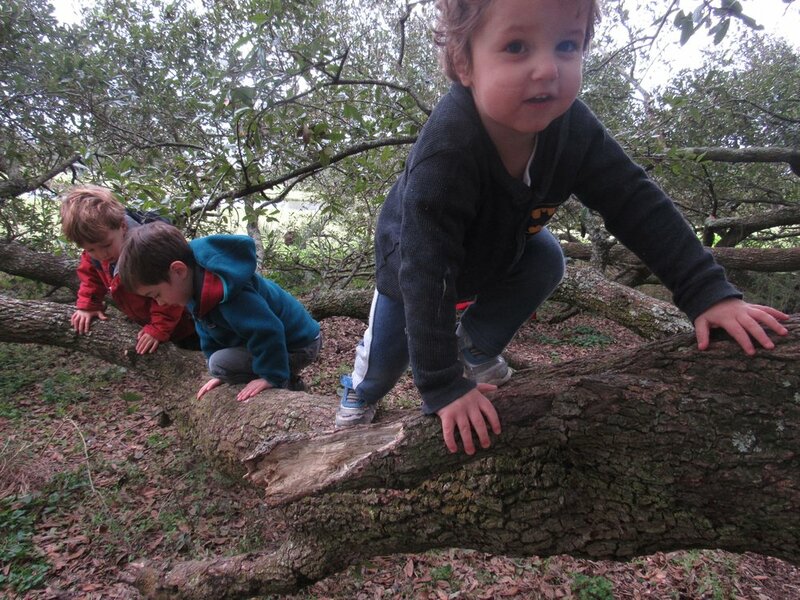 Miss Clare’s group moved between climbing and measuring a tree branch and digging in the mud kitchen. The children are able to explore different units of measurement and learn new vocabulary. They used string and sticks to measure the distance between Eddie and John as they climbed the tree and to measure the distance between John and the ground. In the mud kitchen the children worked with volume when filling the measuring cups with dirt or the the cupcake tins with acorns. By filling the containers with different amounts of dirt or seeds the children are understanding the concepts of more or less and which containers can hold these different amounts. LARRY is busy filling a cup with with dirt and acorns. This is a whole cup. If someone else had a whole cup it would be two cups and you could have a mud fight. AMELIA is filling a measuring cup with dirt. She packs it tightly then turns it over on a plate and places spanish moss around the edges of the dirt dome. LUKE spots a bridge while exploring the water’s edge with Miss Clare, Leo, Amos, And Tommy. Miss Karin set up a dramatic play area for storytelling and imagination. 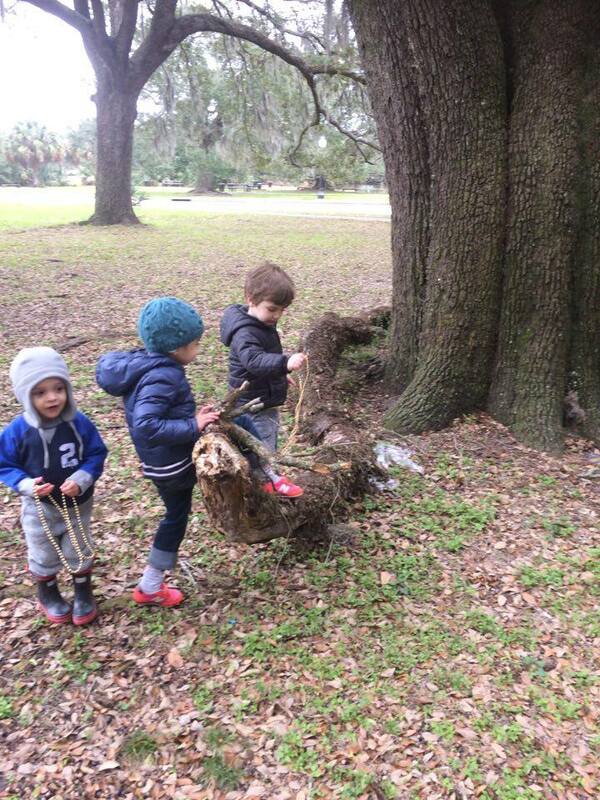 There were man made props like hats, fabric, and beads and natural props such as sticks, pinecones, fallen logs. The children were able to look at the natural props, see their shapes, and imagine them to be something else. One of the most popular props was a fallen log that took turns being a horse, a dragon, and a wave runner. Dramatic play is key component in language development and aids children in understanding their world. John: This is almost like a boat! Eddie: We need a sail. Eleanor: I'm the other captain. John: We are going to Mexico! Eddie is the boat captain too! And this is the steering thing. Emerson: I'm the pirate, but I don't have the map. John: The storm is making big waves. Eddie: I can't get up (on the branch). Help me up! Karin: you just have to practice. Try over here! Eleanor: I practiced how to do it and now I know how to do it! The day was of course filled with tree climbing adventures. We have the best branches for all level of climbing abilities.